Breaking away from all those overly feminine outfits I have been posting recently… way.too.girly ... it's killing me! Hahaha, who am I kidding, I love skirts and dresses so much, they practically make up my entire spring/summer closet. My cousin and I took these photos in the end of spring, hence the jacket. It wasn’t quite 80 degrees (like it is now!) back then so this was just perfect. 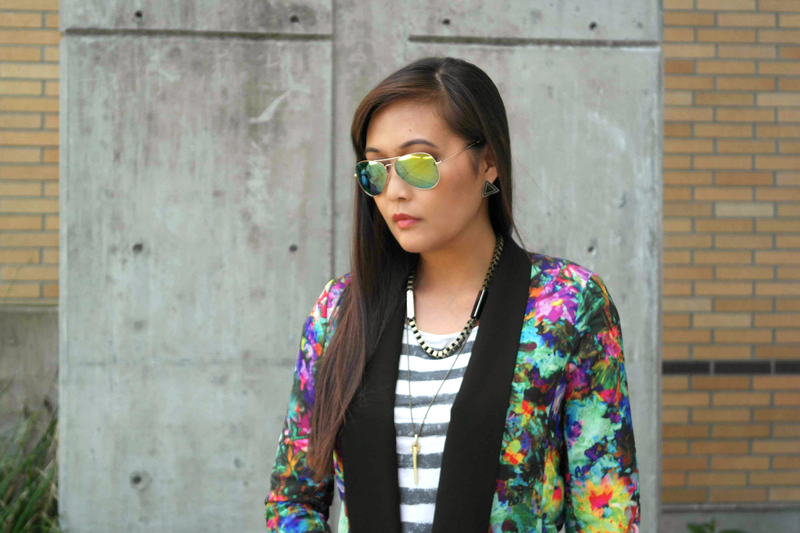 I love the colors on this jacket so much that it needed to make an appearance on a blog post. My outfit preferences on certain days are very mood-dependent, and on some days, my no-brainer outfit is a trusty pair of skinnies and a nice jacket or blazer. Grab and go as I would like to call it. I'm out of the door in, say, an hour? Hahaha, an hour definitely isn’t the definition of grab and go but you guys get the picture! Have you guys thought of what your go-to outfit is on lazy days? To everyone residing in the states, HAVE A HAPPY and SAFE 4th of July!!! Love your jacket so much ! 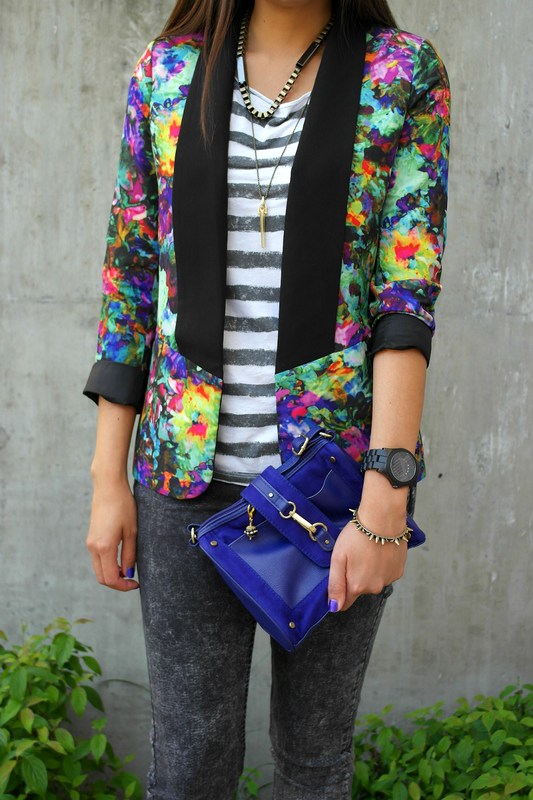 This jacket is amazing, love how you styled it with stripes! This is seriously such a cute look! I love love love this blazer! I love your pattern mixing! That jacket is so cool and pairs perfectly with your striped top! I love the bright colors going on in this outfit! That jacket is a showstopper. thanks again and again Ivete! Love this look! That jacket is super cool and I love how you styled it! Yeah, you were definitely meant to do this fashion blogging thing. :) Great photos, great outfit! I always look forward to seeing what you'll wear next. I love your style! aaaww Gina, you're sweet! thanks! yan ang "mowdel!" :) LOVE IT! love the jacket... i've been wanting my own floral jacket...haven't found the perfect one! lokaret! hahaha salamat ng marami Rhea! 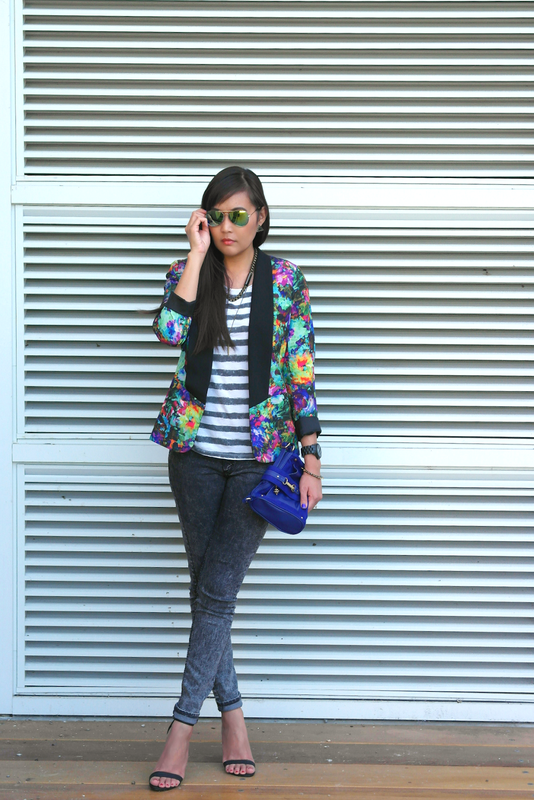 I like your jacket and the way you have mixed the floral pattern with the stripe tee and I love your shoes, great look! This is an amazing jacket and love how you styled it. Great look! Hopping over from the Manic Monday linkup. Love your look against the stripped backdrop. You and your cousins did a great job with the pics! Your blazer is stunning. 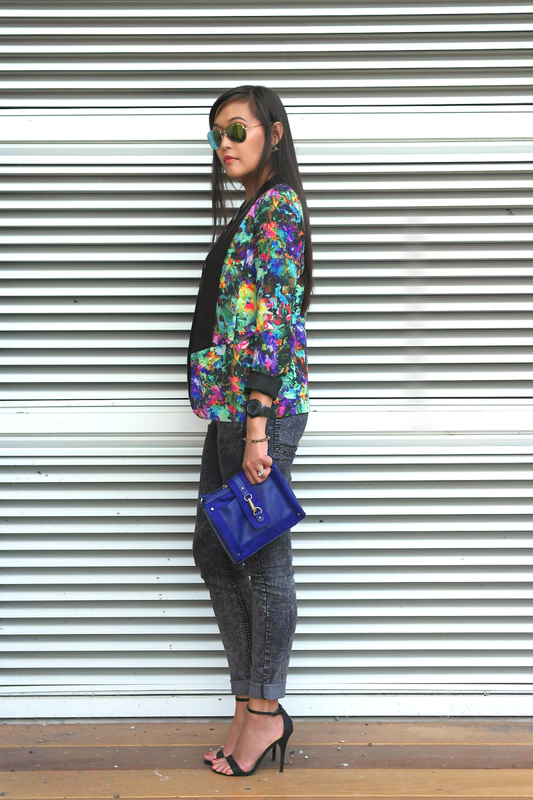 Love the floral print in bold colours which looks great with the black lapel. Looks amazing with your skinnies!